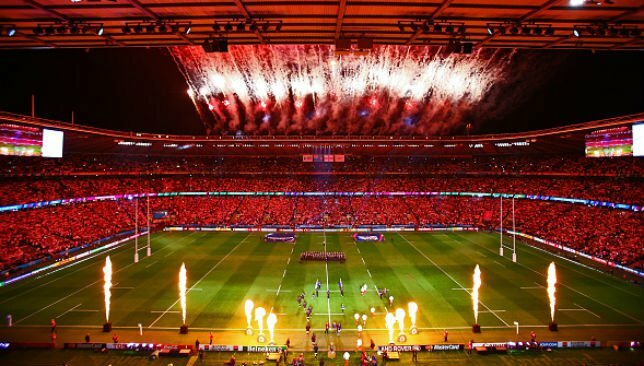 Matches at Twickenham have been played infront of 80,000+ crowds. Two matches remain in the Rugby World Cup with New Zealand taking on Australia in the final, while South Africa and Argentina battle it out for third place. Sport360 takes a look back at the highlights of the past six weeks in photos. England and Fiji kicked-off the tournament at Twickenham. The hosts contained giant Nemani Nadolo to win the game. Japan caused the biggest shock in RWC history beating South Africa. The win sent shockwaves around the world. The joy was short-lived as Scotland overpowered Blossoms. Dan Biggar inspired Wales to an unlikely win at Twickenham. It was all too much for some fans! New Zealand were made to work for their Argentina win. Georgia caused another huge upset, beating Tonga. Ireland beat Romania infront of a 89,267 crowd at Wembley. Wembley also hosted more than 88,000 for a New Zealand game. JP Pietersen finally hit form with a hat-trick against Scotland. 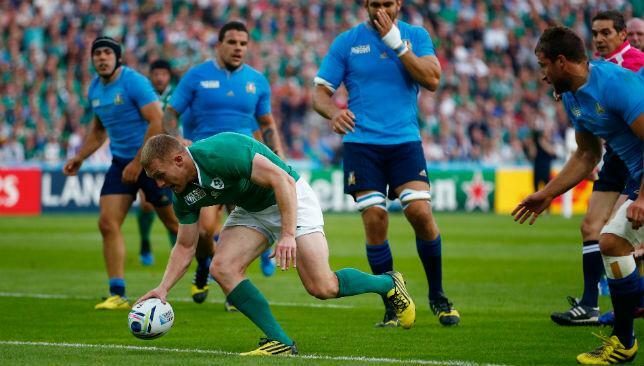 Keith Earls became Ireland's record RWC try-scorer against Italy. Twickenham was bathed in sunshine for England v Australia. But the Wallabies ended the host's tournament with a comfortable win. England fans were mortified at full-time. England became the first host to fail to make the knockout stages. Chris Robshaw cut a solemn figure afterwards. Argentina moved closer to the quarter-finals with a Tonga victory. Diego Maradona was on hand to celebrate with the Pumas. Quarters: Fourie du Preez scores the match-winning try on 78 mins. Quarters: Julian Savea scores a hat-rick in NZ's demolition of France. Quarters: Argentina stun Ireland with a superb 40-23 win. Quarters: Heartbreak for Scotland who conceded late to lose. Semis: Jerome Kaino scores the first try as NZ edge out SA. Semis: Torrential rain did not ruin what was a thrilling encounter. Semis: Australia beat Argentina in a free-flowing match. The Pumas staged a comeback but the AUS were deserving winners. Ireland captain Paul O'Connell on meeting France in their final Pool D game as Joe Schmidt's team advance through to the quarter-finals of the Rugby World Cup. Keith Earls is now Ireland's top try scorer in World Cup history. Peter O’Mahony’s desperate try-saving tackle on Josh Furno spared Ireland’s blushes in a 16-9 victory over Italy, as Joe Schmidt’s men qualified for the World Cup quarter-finals. Schmidt’s side dominated neither territory nor possession in the first-half, and yet still created several chances they could not convert. Johnny Sexton bisected Italy’s line with ease before slotting the opening points from the tee, though Italy then levelled through Tommaso Allan’s first penalty. Earls then strolled home for the first try, Robbie Henshaw standing up in the tackle and wriggling round to pop the scoring pass inside. From the scrum Conor Murray grubbered into the corner, Ireland stole the lineout and struck without mercy. Paul O’Connell won a superlative turnover penalty in his own 22 to relieve early pressure that ought to have been the catalyst to Ireland dominance. Schmidt’s men responded as such, only for Murray to lose the ball at the base, allowing Italy to break with pace and verve. Parisse ghosted into the 13 channel and thought he had sent Furno into the corner. O’Mahony had other ideas however, eating up ground before enveloping the big Italy lock and forcing him into touch just before he dotted down. Again Ireland diced with danger, pulling down an Italy maul to allow Allan to post his third penalty and cut Ireland’s lead to a solitary point. Still Italy pressed, but Parisse – hardly fit after his calf haematoma – could continue no longer. Italy know they are not the same without their inspirational captain, but even with Parisse on the sidelines the Azzurri continued to grind away. O’Mahony’s timing may have been perfect to deny Furno his try, but was potentially-damaging in picking up his yellow card. Italy broke again, still refusing to accept there could be no comeback. But then Ireland turned the ball over once more, Sexton punted for touch, and O’Connell and company tiptoed their way to the last eight. Ireland face Les Bleus in Cardiff to fight out top spot in Pool D, with the winners likely to take on Argentina in the last eight. Elsewhere, Argentina took a huge step to the World Cup quarter-finals with a comprehensive win over Tonga in front of football great Diego Maradona. The Pumas lived dangerously early on against the combative Sea Eagles but a blistering four minutes in the first half proved decisive to seal a 45-16 victory in Leicester. Maradona, who inspired his country to victory in the football World Cup in 1986, saw Juan Imhoff become the Pumas’ all-time Rugby World Cup top tryscorer when he went over during an incisive break and Nicolas Sanchez also scored 26 points. Kurt Morath missed four kicks for Tonga before Argentina hit cruise control in the final 10 minutes thanks to tries from Julian Montoya and Santiago Cordero. Victory over Namibia in their final Pool C game would see Argentina claim the runners-up spot behind New Zealand with Tonga’s hopes hanging by a thread ahead of their final game against the All Blacks.